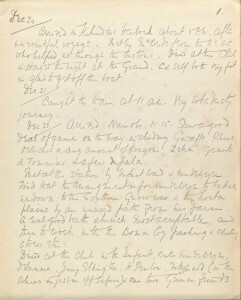 The travel journals of A.W. 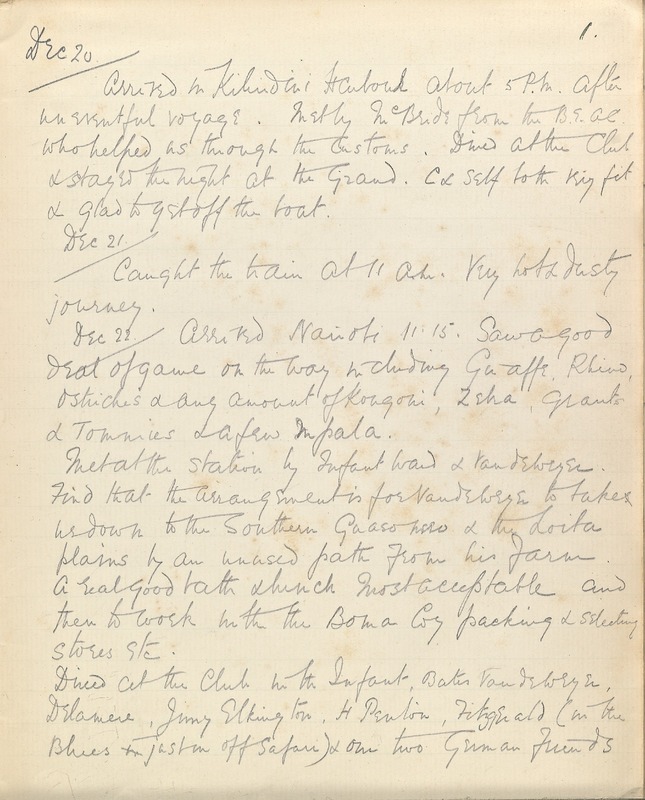 Quilter document his adventures in East Africa between 1909-1911, while on safari and engaging in big game hunting. These fascinating tales are now available in the Transcription Center for volunteers to read and review. While a great deal is still unknown about Quilter, for instance was he British or not, what is known from his journal was that he was a major in the military and embarked on his African safari from Nairobi, Kenya in October of 1909. 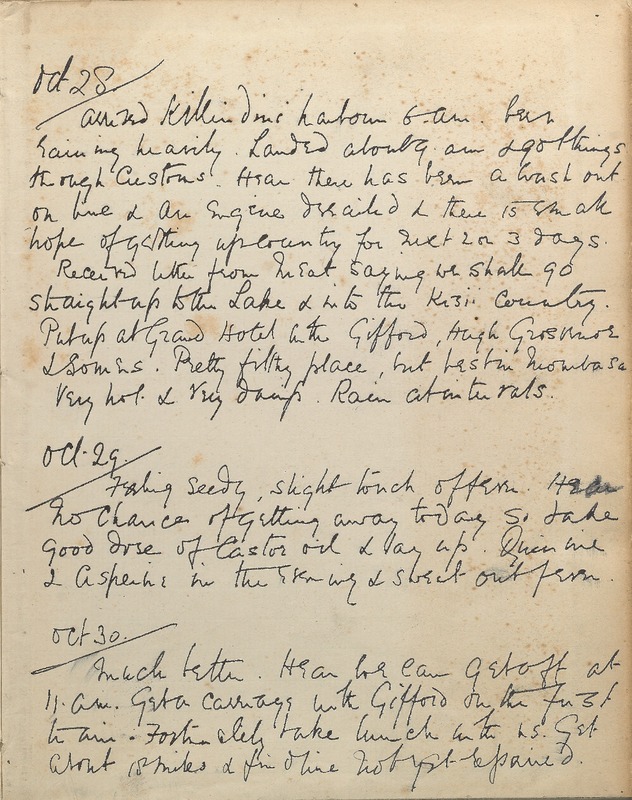 What mysteries could a transcription of his journals uncover? 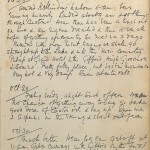 Quilter’s journal comprises two volumes: one detailing his travel adventures from October 28, 1909 through January 11, 1910 and the second volume covering December 20, 1910 through March 7, 1911. Inserted in one of the journals is a tax receipt for a hunting gun dated from 1909, which was issued to A.W. Quilter in Nairobi, Kenya and signed by R. Skene, District Commissioner of Mombasa. A.W. Quilter journal of travels in East Africa, 1909 October 28-1911 March 7. Vol. 2. The start of the journey was delayed due to illness and commences on October 31 with a group of 31 people consisting of hunters, gun bearers, a cook, a headman, and porters to carry the equipment. During the safari, the group encounters a large number of wild animals including: ostriches, giraffes, rhinos, and wildebeests among others. Quilter vividly describes his first encounter with an elephant at close range, provides details of the various indigenous people the group comes into contact with, and his meeting of President Theodore Roosevelt’s son Kermit as part of his African adventures. 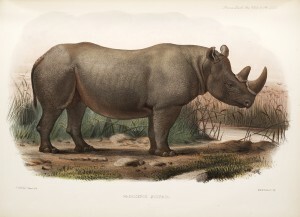 On the rhinoceroses now or lately living in society’s menagerie by Phillip Lutley Sclater, also in the Russell E. Train Africana Collection. Quilter’s journal is part of the Russell E. Train Africana Collection housed in the Joseph F. Cullman Library located in the National Museum of Natural History and part of Smithsonian Libraries. So if you need a cure for your Thanksgiving turkey hangover and Black Friday shopping isn’t your thing then please join us in transcribing this cornucopia of fun. Happy Thanksgiving from the Smithsonian Libraries!